Olivia Cleans Green: Governors Island opens! 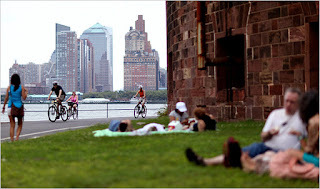 Governors Island opened for the 2011 summer season yesterday. The peaceful island, which is accessible via a brief free ferry ride, is my favorite summer getaway for those times when I want to get out of Brooklyn but not necessarily separate myself from the beautiful people of Brooklyn. If you haven't been to Governors Island, you must go to this magnificent place! It's clean. It's green. It's full of art. It's refreshingly void of corporations trying to pull money out of your wallet. Instead there's simply an awesome little shop of handmade crafts from local artists (Etsy's Better Than Jam) and a place that rents bikes (tip: you can ride free on Fridays for one hour). There are loads of picnic tables and hammocks that offer a view of the Statue of Liberty and our gorgeous waterfront. There's even a three-acre organic fruit and vegetable farm run by the Red Hook-based non-profit Added Value. The Jazz Age Lawn Party and Vendy Awards are two Governors Island-based events that draw large crowds, but check out their calendar for a full line up of family-friendly events happening on the island this summer. I've also put a few events I hope to make it to on the green city events calendar here on my website. Bonus cuteness: This cat castaway knows where it's at!